The Querechos were a Native American people. The Tonto Apache (Dilzhę́’é, also Dilzhe'e, Dilzhe’eh Apache) is one of the groups of Western Apache people. The term is also used for their dialect, one of the three dialects of the Western Apache language (a Southern Athabaskan language). The Chiricahua living to the south called them Ben-et-dine or binii?e'dine' (“brainless people”, “people without minds”, i.e. "wild", "crazy", "Those who you don’t understand"). The neighboring Western Apache ethnonym for them was Koun'nde ("wild rough People"), from which the Spanish derived their use of Tonto ("loose", "foolish") for the group. 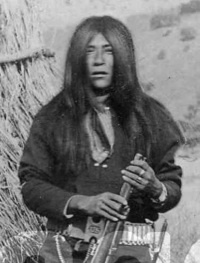 The kindred but enemy Navajo to the north called both the Tonto Apache and their allies, the Yavapai, Dilzhʼíʼ dinéʼiʼ - “People with high-pitched voices”). Chiricahua (/ˌtʃɪrɪˈkɑːwə/ CHIRR-i-KAH-wə) are a band of Apache Native Americans, based in the Southern Plains and Southwest United States. Culturally related to other Apache peoples, Chiricahua historically shared a common area, language, customs, and intertwined family relations. At the time of European contact, they had a territory of 15 million acres (61,000 km2) in Southwestern New Mexico and Southeastern Arizona in the United States and in Northern Sonora and Chihuahua in Mexico. The Salinero Apaches were an Apache group closely associated with the Mescalero Apaches who lived in the area of what is now western Texas, eastern New Mexico and northern Chihuahua in the 18th century. Jicarilla Apache, one of several loosely organized autonomous bands of the Eastern Apache, refers to the members of the Jicarilla Apache Nation currently living in New Mexico and speaking a Southern Athabaskan language. The term jicarilla comes from Mexican Spanish meaning "little basket", referring to the small sealed baskets they used as drinking vessels. To neighboring Apache bands like the Mescalero and Lipan they were known as Kinya-Inde ("People who live in fixed houses"). 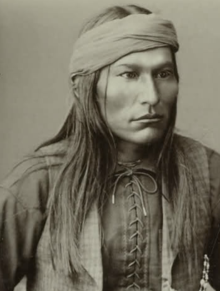 The Jicarilla called themselves also Haisndayin translated as "people who came from below", because they believed to be the sole descendants of the first people to emerge from the underworld, the abode of Ancestral Man and Ancestral Woman who produced the first people. Lipan Apache are Southern Athabaskan (Apachean) Native Americans whose traditional territory included present-day Texas, New Mexico, Colorado and the northern Mexican states of Chihuahua, Nuevo León, Coahuila, and Tamaulipas prior to the 17th century. Buffalo Soldiers monument at Fort Leavenworth, Kansas. 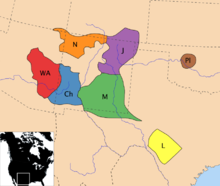 Mescalero or Mescalero Apache is an Apache tribe of Southern Athabaskan Native Americans. The tribe is federally recognized as the Mescalero Apache Tribe of the Mescalero Apache Reservation, located in south central New Mexico. The Fort McDowell Yavapai Nation, formerly the Fort McDowell Mohave-Apache Community of the Fort McDowell Indian Reservation, is a federally recognized tribe and Indian reservation in Maricopa County, Arizona about 23 miles (37 km) northeast of Phoenix. Julia Benites Arriola (born 1952) is a Mexican-Mescalero-American sculptor and curator. Born in Tucson, Arizona to a military family, Arriola studied music at the University of Arizona before joining the United States Navy. After leaving the Navy she spent several years working in manufacturing, building missiles and other high-technology devices. In 1992 she was awarded a Bachelor of Fine Arts (BFA) by the University of Arizona, and in 1996 a Masters of Fine Arts. In 1994 she was awarded a Graduate Fellowship by the University of Arizona, along with the Rutgers Purchase Award at the Works on Paper Exhibition and a Museum Purchase Award from the Hoyt Institute of Fine Arts. Massai (also known as: Masai, Massey, Massi, Mah–sii, Massa, Wasse, Wassil or by the nickname "Big Foot" Massai; c.1847-1906, 1911) was a member of the Mimbres /Mimbreños local group of the Chihenne band of the Chiricahua Apache. He was a warrior who escaped from a train that was sending the scouts and renegades to Florida to be held with Geronimo and Chihuahua. Mangas Coloradas or Mangus-Colorado (La-choy Ko-kun-noste, alias "Red Sleeve"), or Dasoda-hae ("He Just Sits There") (c. 1793 – January 18, 1863) was an Apache tribal chief and a member of the Mimbreño (Tchihende) division of the Central Apaches, whose homeland stretched west from the Rio Grande to include most of what is present-day southwestern New Mexico. 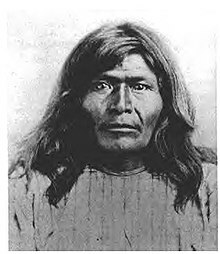 He was the father-in-law of the Chiricahua (Tsokanende) Chief Cochise, the Mimbreño Chief Victorio and the Mescalero (Sehende) Chief Kutu-hala or Kutbhalla (probably to be identified with Caballero), and is regarded by many historians to be one of the most important Native American leaders of the 19th century due to his fighting achievements against the Mexicans and Americans. Mildred Cleghorn (December 11, 1910 – April 15, 1997) was first chairperson of the Fort Sill Apache Tribe. Alsate, also known as Arzate, Arzatti, and Pedro Múzquiz, (ca. 1820 – 1881/1882) was the last chief of the Chisos band of Limpia Mescalero Apaches.
) was a leader of the Mescalero Apache Indian nation. Wendell Chino was born in Mescalero, New Mexico, on 25 December 1923. ... that future Phoenix mayor James D. Monihon's regiment was attacked by an estimated 450 Apaches led by chief Cochise during the American Civil War? Do you have a question about Apache that you can't find the answer to? This page was last edited on 6 February 2019, at 06:52 (UTC).